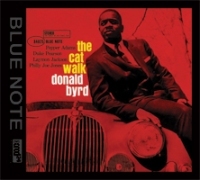 Donald Byrd has had an episodic and very productive career. Whether it was playing at recorded jam sessions for Prestige in the 1950s, combining voices with a hard bop group on Cristo Redentor, or becoming a major commercial success in the 1970s with his funk/R&B recordings, the trumpeter was in the musical headlines for decades. The finest group of his career was the quintet that he co-led with baritonist Pepper Adams during 1958-62. The blend between Byrd and Adams, their individuality, and the sparks that always flew when they performed together were always mutually inspiring. The Cat Walk is arguably their finest recorded collaboration. With pianist Duke Pearson (who would work with Byrd throughout the 1960s), bassist Laymon Jackson and drummer Philly Joe Jones, The Cat Walk has an all-star lineup. Pearson's four compositions (one co-written with the trumpeter), highlighted by "Hello Bright Sunflower" and "Dukes Mixture", helps give this group its own unique identity even beyond the sound of the two horn greats. The results are quintessential hard bop that is essential and certainly a highlight in the careers of Donald Byrd, Pepper Adams and Duke Pearson. Recorded by Rudy Van Gelder on May 2, 1961, at Rudy Van Gelder Studio, New Jersey.This XRCD24 released in 2010.